Homes at Jumeirah Luxury Living ... equipped with smart technologies. 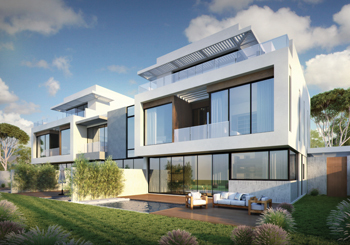 Taking shape in Dubai’s Jumeirah Golf Estates are 291 townhouses that will boast heights of luxury and smart technologies, offering three different types of views to suit their owners’ tastes. In fact, so good was the customer response that about 40 per cent of the first phase was sold at the recent Cityscape Global alone, Ahmed Mokhtar, the project director at Jumeirah Luxury Living, tells Gulf Construction. The leading property showcase was held in Dubai last September. Tenders have been issued for the main construction contract for the property, and key and prominent companies have been invited, he says. “The contract is expected to be awarded by the year-end and it will include engineering, construction, infrastructure, and all services required for the project,” Mokhtar adds. Once complete in late 2019, the Dh1-billion ($272 million) development featuring 291 luxury townhouses aims to offer unparalleled views and access to the world-class ‘Fire’ golf course. The townhouses feature three, four, or five bedrooms, spread over a two-floor layout, in addition to the roof. The project has three main themes – Golf, Flowers, and Water – offering residents three different and unique views. Situated adjacent to the golf course, the striking new residential development offers the opportunity to customise the design, interiors, and layout to each individual’s tastes and requirements. Alongside its rustic charm, each residence has been designed to ensure a smart, secure and sustainable environment. The townhouses ... serene setting. The units have been designed in a smart way to allow the owners to tailor their homes and experiences. Each unit also has a large private garden and wide terraces to take in the natural views of the golf course, flowers and the lake. Mokhtar says the aim of Jumeirah Luxury is to provide home-buyers with bespoke, customisable homes as well as a smart, secure and sustainable living environment. Technological features are managed via an app, with Bluetooth locks that can be controlled remotely, automation systems, energy optimisation, smart cooling and heating, he says. “Outside,” he continues, “the gardens are equipped with solar power and smart irrigation systems that regulate heat and moisture levels. Fire safety and CCTV security are also well considered, with the option of real-time surveillance, light sensors, panic buttons and direct contact with the police and fire department in the event of an emergency. The intricately designed Asian, Arabian- and European-inspired gardens, the plaza and fountains, and a 360-degree view of the golf courses offer an experience that is exclusive to the Jumeirah Luxury project, Mokhtar adds. The amenities at Jumeirah Luxury Living include communal gardens, a central square containing dedicated areas for an open gym and children’s play, a community centre with a convenience store, a restaurant, a delicatessen and a spa. 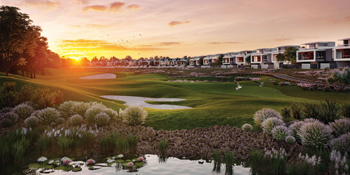 In addition, residents will also have access to the world-class amenities of Jumeirah Golf Estates, including a wealth of dining options, health and well-being facilities and a golf pro shop. Mokhtar says the project and unit concept design were done in-house by Jumeirah Luxury Living’s experienced staff, who have more than 15 years of experience in the real estate development design field. The designs were carefully thought out to be able to incorporate the infrastructure of the smart and sustainable technologies. So far, the infrastructure work – including the four substations within the development – for the project has been completed. All required services are fully connected to the perimeter of each residential plot. According to Mokhtar, work on site is more than 20 per cent. The roads are complete and link to the plots and are fitted with all the required streetlights. The completion date for the villas is anticipated to be in Q4 2019, he says.